1.1	The Site contains proprietary notices and copyright information, the terms of which must be observed and followed. Redwall grants you a non-exclusive, non-assignable, non-sublicensable and non-transferable license to access and display, for your personal, non-commercial use, one copy of the Content that you download from the Site, except as may otherwise be expressly provided on the Site. This Site and all Content in the Site may not be copied, reproduced, republished, modified, uploaded, posted, transmitted, distributed, or used for the creation of derivative works without Redwall's prior written consent. You may not mirror any of the Content from the Site on another Web site or in any other media. The license to use the Site is conditioned on your not modifying the Content displayed on the Site, your keeping intact all copyright, trademark, and other proprietary notices, and your acceptance of any terms, conditions, and notices accompanying the Content or otherwise set forth in the Site. Except as described in the limited license above, Redwall does not grant you any express or implied rights or licenses under any patents, trademarks, copyrights, or other proprietary or intellectual property rights. 1.3	When visiting the Site and using the electronic communications means on the Site you agree that you will only submit, upload, share, post, publish, transmit, or otherwise make available information that you have the right and authority to share. You agree that you will not share any content that: (a) is information other than that which may be requested by an interactive application or tool on the Site; (b) is binary executable code; (c) is illegal, false or misleading, indecent, obscene, libelous, defamatory, disparaging, degrading, harassing or promoting bigotry, racism, hatred or harm; (d) is material that would violate or infringe or promote the violation or infringement of intellectual property, privacy or other rights of third parties; (e) violates or promotes the violation of any applicable laws or regulations; (f) contains a solicitation of funds, goods or services, or promotes or advertises goods or services (g) contains any viruses, Trojan horses, or other applications and/or components designed to limit or harm the functionality of a computer. 1.5	Access to and use of password protected or secure areas of the Site is restricted to authorized users only. You agree not to share your password(s), account information, or access to the Site. You are responsible for maintaining the confidentiality of password(s) and account information, and you are responsible for all activities that occur under your password(s) or account(s) or as a result of your access to the Site. You agree to notify Redwall immediately of any unauthorized use of your password(s) or account(s). Unauthorized individuals attempting to access these areas of the Site may be subject to civil liability or criminal prosecution under applicable laws. 2.1	Information on the Site is not promised or guaranteed to be correct, current, or complete, and the Site may contain inaccuracies or errors. Redwall assumes no responsibility to monitor the accuracy, completeness, timeliness or reliability of any information on the Site and assumes no responsibility, and expressly disclaims responsibility, for updating the Site to keep information current or to ensure the accuracy or completeness of any posted information. Information may not be updated when errors are uncovered or as new information becomes available. Redwall provides no assurances that any reported problems will be resolved by Redwall, even if Redwall elects to provide information with the goal of addressing a problem. Reliance on the information on the Site is done so at your sole risk and you hereby release Redwall from any and all liability associated with same. 2.2	You should confirm the accuracy and completeness of all posted information before making any decision related to any services, products, or other matters described in the Site. 3.1	The Site may provide material and information owned or licensed by third parties and/or links or references to non-Redwall Web sites and resources owned by third parties, (singularly and collectively “Third-Party Content”). 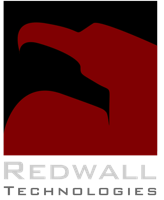 Redwall makes no representations, warranties, or other commitments whatsoever about any Third-Party Content and shall not be responsible or liable for the accuracy, reliability, or availability of any content, information, data, products, services, or other statements that may be referenced or accessible from, or linked to the Redwall Site. Access to and use of any Third-Party Content is at your sole risk; it is up to you to take precautions to protect yourself from viruses, worms, Trojan horses, and other potentially destructive programs, and to protect your information as you deem appropriate. 3.2	Inclusion or any Third-Party Content shall not be construed as Redwall’s endorsement of, authorization of, sponsorship of, use of, or relationship with, the Third-Party Content or its owner, nor does it grant you rights or licenses in the Third Party Content. In addition, Redwall is not a party to or responsible for any transactions you may enter into with third parties, even if you learn of such parties (or use a link to such parties) from the Redwall Site. You agree to defend and hold Redwall harmless from any and all liability that may result from your use of the Third-Party Content. 3.3	When you access a non-Redwall Web site, even one that may contain the Redwall logo, please understand that it is independent from Redwall, and that Redwall does not control the content on that Web site. Note that if a third-party website links to the Site, it may not be known to or authorized by Redwall and therefore is not necessarily an endorsement, authorization, or sponsorship by Redwall, or indicative of any relationship with Redwall. 4.1	Any trademarks, trade names, trade dress, service marks, logos, domain names, URLs, information, text, graphics, and software that make up the Site or appear in the Site (collectively, the "Marks") are the property of Redwall or the respective third-party owners. You acknowledge that the Marks on the Site are protected by copyright, trademark, patent, or other intellectual property rights of Redwall or third-parties and no right to use the Marks has been conferred to you. Except as expressly provided herein, nothing within the Site shall be construed as conferring any license under any of Redwall's or its licensors' intellectual property rights in any way and should not be used by you or any third-party without written authorization by Redwall Technologies, LLC. REDWALL MOBILE is a registered trademark of Redwall Technologies LLC. All rights reserved. Other trademarks on the and the files downloaded from the site include RClient, RCore, RInit, and Rserver. 5.1	Redwall does not want to receive proprietary information from you through or in connection with the Site. Please note that any material or information ("Submission") included therewith, shall be considered non-proprietary, available to use on an unrestricted basis, and you grant Redwall a worldwide, perpetual, royalty-free, irrevocable, nonexclusive, fully sublicensable license to use, reproduce, modify, adapt, translate, publish, publicly perform, publicly display, broadcast, transmit and distribute the Submission for any purpose and in any form, medium, or technology now known or later developed. This includes, without limitation, the right to incorporate or implement the Submission into any Redwall product or service, and to display, market, sublicense and distribute the Submission as incorporated or embedded in any product or service distributed or offered by Redwall without compensation to you. You warrant that: (a) you have the right and authority to grant this license; (b) Redwall's exercise of the rights granted pursuant to this license will not infringe or otherwise violate any third party rights; and (c) all so-called moral rights in the information Submission have been waived to the full extent allowed by law. 5.2	Redwall will not release your name or otherwise publicize the fact that you submitted materials or other information, the Submission(s), to the Company unless: (a) we obtain your permission to use your name; or (b) we first notify you that the Submission will be published or otherwise used with your name on it; or (c) we are required to do so by law. 6.1	Content Redwall publishes on the World Wide Web may contain references or cross references to Redwall products, services and/or programs that are not announced or available in your country. Such references do not imply that Redwall intends to announce or make available such products, services and/or programs in your country. Certain text in the Site may be made available in languages other than English where text may be translated by a person or solely by computer software with no human intervention or review. Redwall makes no representations or commitments regarding the accuracy or completeness of the translation, whether or not computer-generated or performed by a person. Please see the below Disclaimer of Warranty for additional conditions. 8.1	All links to this Site must be approved in writing by Redwall, except that Redwall consents to links in which the link and the pages that are activated by the link do not: (1) create frames around any page on this Web site or use other techniques that alter in any way the visual presentation or appearance of any content within this site; (2) misrepresent your relationship with Redwall or imply that Redwall approves or endorses you, your Web site, or your service or product offerings; and (3) present false or misleading impressions about Redwall or otherwise damage the goodwill associated with the Redwall name or trademarks; (4) violates any laws. As a further condition to being permitted to link to this site, you agree that Redwall may at any time, in its sole discretion, terminate permission to link to this Web site. In such event, you agree to immediately remove all links to this Web site and to cease using any Redwall trademark. 9.1	Use of the site is at your sole risk. The site, and all content provided on or through the site, are provided on an "As is" and "As available" basis with no warranties or guarantees whatsoever. Redwall expressly disclaims to the fullest extent permitted by law all express, implied, statutory, and other warranties, guarantees, or representations, including, without limitation, the warranties of merchantability, fitness for a particular purpose, title, non-infringement, or those arising from a course of dealing, usage, or trade practice with respect to the site and all content provided on or through the site. Without limitation, Redwall makes no warranty or guarantee that: (A) the site will be uninterrupted, timely, secure, or error-free; (B) that the site or content will meet your requirements; (C) the results that may be obtained from the use of the site or any content provided on or through the site will be accurate or reliable; Or (d) the quality of any content purchased or obtained by you on or through the site will meet your expectations. 9.2	You understand and agree that if you download or otherwise obtain or use any content you do so at your own discretion and risk and that you will be solely responsible for any damages that may result, including loss of data, or damage to your computer system or network. 9.3	Some jurisdictions do not allow the exclusion of warranties, so the above exclusions may not apply to you. 10.1	In no event will Redwall its officers, employees, directors, suppliers, or any other party involved in providing the site or content on the site, be liable to you or any other person for any direct, indirect, incidental, special, exemplary or consequential damages of any type whatsoever related to or arising from the site or any use of the site, or of any web site or resource linked to, referenced, or accessed through the site, or for the use or downloading of, or access to, any content, including, without limitation, any lost profits, revenues, business interruptions, lost savings, costs of replacement goods, loss or damage to data, software or hardware, errors, defects, mistakes, omissions, deletions of files, delays in operation or transmission, nondelivery of information, disclosure of communications, or any other failure of performance of the site, the content, any Redwall product or service, or any other hyperlinked website, or any damages resulting from the use of or reliance on the site and/or the content presented, even if Redwall is expressly advised of the possibility of such damages or should have known of the possibility of such damages. This exclusion and waiver of liability applies to all causes of action, whether based on contract, warranty, tort, or any other legal theories. 12.1 All matters relating to your access to, and use of, the Site and Content provided on or through or uploaded to the Site shall be governed by the laws of the State of Ohio, the State of Illinois, or U.S. federal law. By using the Site, you agree that any dispute, legal action or proceeding between you and Redwall that concerns or relates in any way to the Site, Content, links or any information relating to the foregoing shall be instituted in a state or federal court, as applicable, in the City of Beavercreek in Greene County in the state of Ohio, U.S.A. You and Redwall agree to submit to the jurisdiction of, and agree that venue is proper in, these courts in any such legal action or proceeding. Redwall's technology is not ITAR or CCI restricted, and we welcome inquiries from all US allies.